It is interesting to note that this method cannot be used to reconvert NTFS file system back to FAT32. To reconvert back to FAT32, you will need to format the entire drive which will definitely cause data loss. 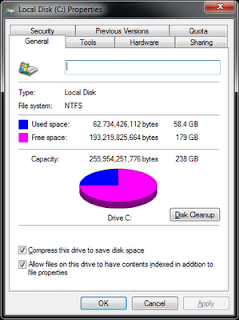 You have a flash drive or probably an external hard drive that currently has FAT32 file system and you want to change it to NTFS, because FAT32 does not support handling large files (over 4GB) or it is just simply old for your taste but there is just one problem, you don't want to lose your saved data. This article is for you then as it explains exactly how you can achieve seamless transition from FAT to NTFS without involving any data loss. Important: While this method works perfectly, I would still advise you to backup your data in case anything goes wrong. 1) Go to Computer, and note the name of the drive whose file system you wish to convert. 3) Type cmd in the search bar if you use Windows 7, Windows 8, Windows 8.1 or Windows Vista. If you use Windows XP, click on Run and then execute cmd. 4) Execute "chkdsk h: /f " (without quotes) where H is the letter of the drive to undergo conversion. This checks the drive for errors and fixes them automatically. 5) Execute "Convert H: /FS:NTFS" (without quotes). H is again the letter of the drive to be converted. 6) The command prompt will start the conversion process and after a few minutes, CMD will say that conversion was successful. 7) You can check it in the properties of the drive through right click<Properties. This command can also be used to convert FAT16 disks and works on Windows 8, Windows 8.1,Windows 7, Windows XP and Windows Vista. I converted my flash drive's file system using these steps and it worked flawlessly. ex. if i have larger than 100gb of data(Softwares or documents) in my any one of the harddrive perition and i want to repair that partiotion without lossing the data than what i have to do??? I have googled lot.. finaly i didnt got any sollution but if u have one of the sollution than please share and help..
because chkdsk is nodowt best but very very slow for larger amount of data..
i takes arouund 2 days of scan if you need to repair your any exrternal hdd partion . Let's see how can we do that. RUN THE FILE AS ADMINISTRATOR OR ELSE IT WONT WORK. It is a 3x3 matrix in which we have to arrange numbers from 1-9 in such a way that the sum of all rows and columns is equal to 15. Program for that in which user have to decide where to put 1. NOTE :- Value of i and j starts from 0. In this article you will find out how to Send files from one computer to anotherwith Lan cable (cat5). I never liked using big pen drives to share large data ( like big games,movies etc) so the only thing I am left with, was using lan cable.